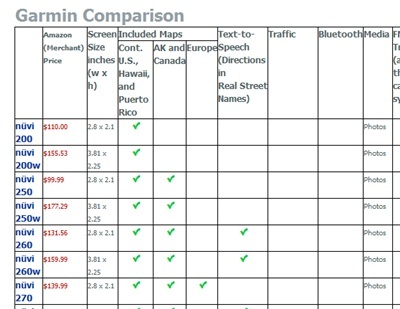 I am recently checking on the GPS and I have never bought one before, so while I checking out the websites, I found this Garmin GPS Comparison Chart from www.garmin-250.com. Basically it shows all the models from Garmin with current Amazon prices , so it is very convenient for me to compare. I prefer the models that has Speech to Text feature. Text to Speech feature is a important since it would be difficult to know exactly where I am during driving a car. But I wonder how good their speech quality is. Maybe I should check out Youtube . I am not sure if I buy Garmin brand, but it is the most popular ones. I wonder how those other non popular brand GPS (Sony or Navigon) are in terms of quality over prices. Amazon prices reflect Early November 2009 prices and maybe different at the time of your reading. Eventually I bought Garmin nuvi 1200 but Garmin nuvi 1250 is a better deal with speed limit display function but they are almost the same price. Bluetooth capability is useful if you want to connect your wireless phone and use GPS as hands free device. What’s interesting is that you can also get that information by visiting any Garmin nuvi Product Page on Amazon, which I can only assume is where the information was being pulled from. Either way, having all those details in front of you is very useful. The list is quite nice especially it has all the amazon.com prices. So I can compare it quickly. So which Garmin GPS did you buy? Thanks for the comment , I bought Garmin nuvi 1200 3.5 inch GPS. It’s smaller and support Text-to-Speech function.